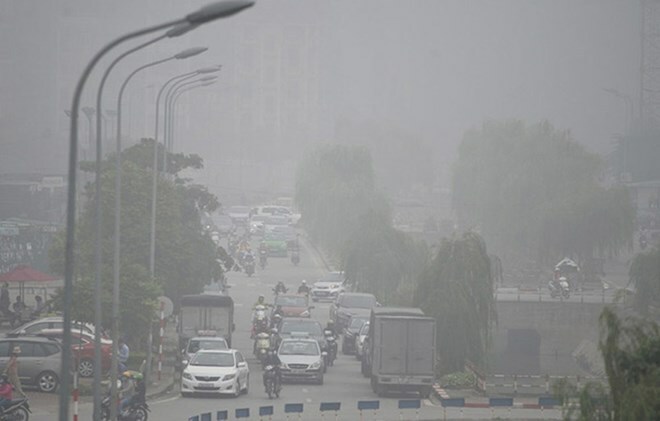 Hanoi (VNS/VNA) - Hanoi residents are worried about the bad air quality they have been experiencing in the city since the beginning of the year. The latest air pollution data compiled in the 2018 World Air Quality Report ranks Hanoi as the second most polluted city in Southeast Asia, behind only Jakarta. Air pollution in the city became so severe at the end of January that health experts warned people to stay indoors. The city’s Air Quality Index was measured at between 201 and 240 at various monitoring stations across the capital, while anything between 201 and 300 is considered very unhealthy. Hoang Lan Anh, a resident of Tay Ho District, choked on toxic air every day as she travelled on Vo Chi Cong Street to work. Do Viet Cuong, a resident of Trung Hoa-Nhan Chinh borough in southwestern Hanoi, said: “This is an area with a lot of offices and high-rise buildings, so a lot of people travel here to work on a daily basis. The heavy concentration of particulate PM2.5 in the city’s air has also raised health alarms. It was often measured at 300-400 micrograms per cubic metre at monitoring stations near areas with high traffic density, far exceeding the World Health Organisation’s safety limit of 25 micrograms. PM2.5 refers to tiny dust particles that are about 30 times smaller than a human hair. They can travel deep into the lungs and the blood and cause respiratory and heart-related diseases, even cancer, according to Dr Hoang Duong Tung, head of the Vietnam Environment Administration. Mai Trong Thai, head of the Hanoi Environment Protection Department, the city’s air quality has been getting worse over the past three months due to erratic weather and pollution caused by traffic and construction.“Hanoi has been affected by the seasonal north-east wind, which brings dust from other areas to the city and causes heavy concentration of fine particulate matter in the air. The weather is expected to change more drastically as a hotter summer than previous years has been forecast, according to data from the Ministry of Natural Resources and Environment. The average temperature from April to August is forecast to be 0.5-1 degree Celsius higher than in previous years. Intense heat might appear earlier than previous years in the northwest and central regions. Thai said the city is running a comprehensive air quality improvement scheme in order to fight air pollution. “We are trying to fast-track a plan to plant one million trees and reduce the use of personal vehicles,” Thai said.